Easier than swallowing a pill. When we think of drugs that we can take at home, we may conjure up images of pills, gel capsules, or liquids. Even when doctors write down a prescription, it’ll usually be for a drug coming in one of the aforementioned forms. And it’s likely it’ll be the same amount for multiple people suffering from the same condition, even if some will benefit from the medicine more than others. This is due to the way medicines are mass produced; nothing is really tailored for a specific person. The mass production of drugs isn’t inherently bad, but it does mean everyone is getting the same exact treatment, even if some may need more or less of it. A team of researchers from the University of Copenhagen, in collaboration with colleagues from Åbo Akademi University in Finland, believe they’ve come up with a new solution to producing medicine with more accurate dosage: edible QR codes. Okay, maybe it’s not a radically different idea, since you still have to consume something, but there’s more to it than how it gets into the body. And it’s probably easier to swallow than a tiny, unfolding robot. You see, the QR code is the medicine itself, as well as the label and description. As Natalja Genina, Assistant Professor at Department of Pharmacy and one of the researchers of the study, explains, the code enables the medicine to be tailored to a specific patient and the dose can be the exact amount they need. Of course, QR codes are meant to be scanned, otherwise they’re just pictures. When they’re scanned, they reveal all the information about the medicine. That includes what it is, and how much of it the code contains. Identifying the medicine should be just as easy as taking a picture, since everyone has a smartphone with a decent camera, and there are hundreds of QR code scanning apps for people to use — heck, the iPhone has one built into its camera. 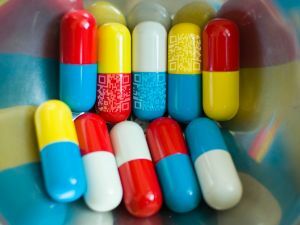 Making it a scannable QR code could also reduce the chances of people taking the wrong medication, or tricked into taking fake or expired drugs. These situations will be even easier to avoid once the team determines how to get an everyday inkjet printer to apply the medicine as a QR code. That said, the special edible material will have to be produced in advance to enable on-demand production. Sorry to say, but you probably won’t be able to print the medicine on, say, a piece of lettuce, and consume it that way. However, if this proves to be the future of medicine, you may not have to leave home to get your prescription refilled. Imagine the time (and money) you’ll save. It’ll be some time before QR code medicine shakes up the pharmaceutical industry. For now, the researchers are still working on refining their production methods. Organizations like the US Food and Drug Administration have approved alternative forms of medication in the past, like the smart pill that knows when its ingested, so they might be open to approving edible QR codes too.